The ERCOT Board of Directors has a target planning reserve margin of 13.75%, but a study submitted by ERCOT to the Public Utility Commission of Texas in January 2015 concluded that 16.75% would be more appropriate to maintain reliability levels that would result in no more than one day of outages in 10 years (source: Platts). Despite the lower reserve margin, ERCOT expects to have enough generation available to serve consumer needs this summer. It is worth mentioning that in the event of extreme load the reserve margin could drop to 2.7%, with capacity available for operating reserves at 1,921 MW (Less than 2,300 MW indicates risk of EEA1- Energy Emergency Alert). 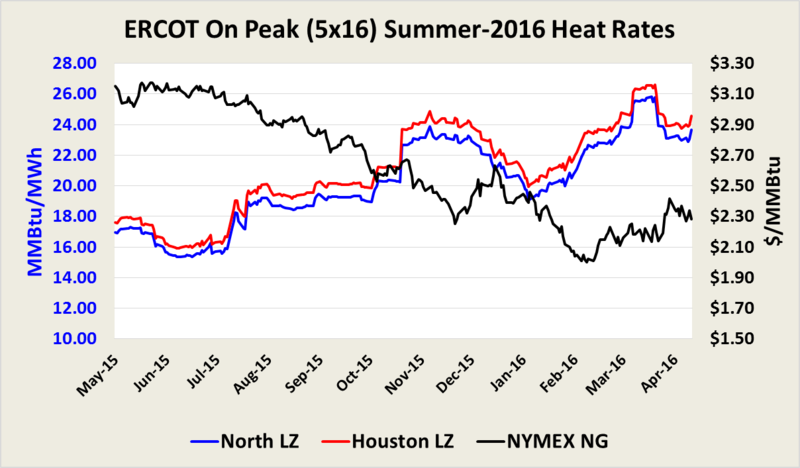 The Chart below shows the inverse relationship between NYMEX Henry Hub natural gas prices and ERCOT heat rates. Summer-2016 fixed prices have remained relatively steady during the last 12 months as a decline in natural gas prices has offset the increase in heat rates. Fixed electricity prices have rebounded from the lows reached in late February-2016 due to higher natural gas prices. As we approach the summer we expect to see higher heat rate volatility as a result of lower than previously expected reserve margins and shifts in summer weather forecasts. During the summer, electricity prices typically reach their highest level when total demand is high and when more expensive generation is added to meet the increased demand. Consequently, prices are very sensitive to changes in demand expectations during the summer. The number of active rigs drilling for crude and natural gas has dropped to 415 (lowest level since 1949). Recent Bentek Energy data shows daily production from April 1 through April 23 declined 1.0% compared to average production in March, and a full 2.5% lower than the average production in February. Therefore, it is likely that power prices will rise over the summer. Evaluating longer term transactions will likely pay off in several markets. Contact your Acclaim Energy representative to discuss your current situation and determine what strategic sourcing strategy best fits your risk profile.